One of the last things a woman looks forward to is getting a mammogram. First, there's the stress of wondering what the xrays will show and the Big C is, of course, what we are worried about. And then, there's the utter (sic) humiliation and pain involved in the process of taking those radioactive pictures! 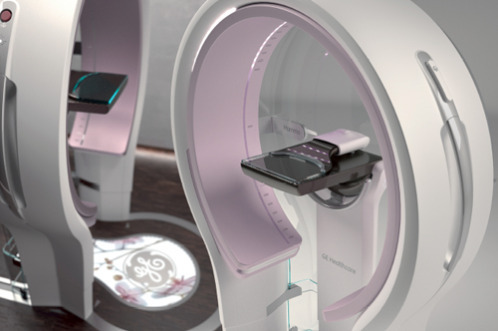 But GE has come up with a new mammography machine that has received a 2009 IDEA design excellence award! The Mammo NEXT, still in the concept stage, attempts to make the whole experience of getting a mammogram less painful, less impersonal, and less humiliating. One might say it's a patient-centered design. The patient not only faces the technician during the procedure, so they can communicate verbally and non-verbally, but she gets to control the compression of her breast in the "vice." Well, it's a step in the right direction. I have to say that it does look more friendly than the current mammography machines. Now, if the Mammo NEXT could also quickly zap any cancerous cells that might be hanging out in our breasts, that would really be an IDEA! I Drink Your Canned Pancake Milkshake!